Recently, in light of the upcoming Freedom Film Fest, I decided to check out the winners from last year’s competition. There are usually three projects selected from a significant number pitched to Pusat KOMAS, the organisers of the fest. The winners would then get a grant to complete their project. Of course, Pusat KOMAS being Pusat KOMAS, the subject matter tend to be very political at times, but then again, it is precisely these stories that struggle to get any sort of airing to begin with. That is the case with Nadira Ilana’s ‘The Silent Riot’. I actually checked this film out a number of moons ago, when we were both interviewed on the BFM Radio show, ‘Reeling Southeast Asia’, and I became curious about her cinematic vision and ideas. She has made a number of other works that could be found floating around out there, but this seems to be the one that has pushed her into the spotlight the most. 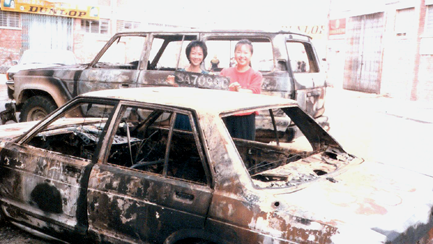 It tells of the events that took place in the mid 1980s in Kota Kinabalu. Parti Bersatu Sabah (PBS) had just won an election that sunk the federal government’s preferred partner, Parti Bersatu Rakyat Jelata Sabah (BERJAYA). I use the word ‘sunk’ deliberately, because the prime minister of the time, Dr Mahathir, had thrown his full support behind BERJAYA, proclaiming that they would sink or swim with them. Though it was not an expected outcome, sink BERJAYA did, but they succeeded in swimming as well, becoming the kind of sharks that hunted their prey with ruthless aggression and lashing out at those who appeared to have caused it. 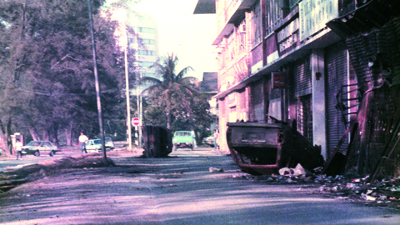 As a result, there were weeks worth of unrest, with a number of people ending up dead. With such mayhem, though, no one side could claim to come out smelling like roses, and this documentary seeks to put on record the scent emanating from the other side of the garden we rarely see. For the most part, I have to admit that many of the names actually flew by without me truly registering their significance. I am reminded of my experience watching the film ‘Il Divo’, an Italian political thriller. The only name that jumped out at me was Silvio Berlusconi, and that was because he owns AC Milan. In an analysis surmising its chances of landing an Oscar award in 2010, Fazil wrote: “…if you’re having a hard time trying to discern who is Servilo and who is Andreotti, imagine what I had to go through while watching the movie with names like Scafari, Evangelisti, Lima, Pomicino, Aldo Moro, Pecorelli, Sbardella, Cossiga, Sindona, Badalamenti etc.” For those, read Mustapha, Kitingan, Mansoor, Lampong, and others. Perhaps it would help if they had owned European football clubs. Calm after the storm. Or is this before? On a more serious level, I’m just watching this documentary at a bad time. My interest in the intricacies of Malaysian politics have waned greatly over the past few years. 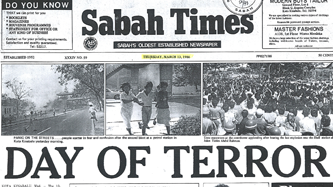 There once was a time when I would scroll down and click on very single link available on Malaysia Today and other such websites, and be enthralled by the stories told in relation to Malaysian politics. Over time, however, it dawned on me how much time and emotional energy I spent being angry at things I couldn’t really do much to change. Though I still keep in touch, I started to concentrate on the things that I can change. While it has led to wonderful fulfillment on so many levels, it also meant that my appetite for something almost purely political is not all that high. Can we, however, substitute the word ‘political’ for ‘historical’ in this context? Maybe, maybe not. Then again, can we truly separate politics and history as we know them? Again, the answer is less clear than some want it to be. In the context of this film, I did not really think about this until near the end, where the final part of the voice over narration (in terms of tone as well as the words delivered) might help you make your mind up, should you need to. Having said all that, Nadira was clever enough to explore a more human side in some parts of the documentary. By that, I mean the recording of subject matters who do not appear to have a direct link to the political affairs of the time. She got in touch with people who were there, whose interest were little more than to just survive the difficult times. Some even went back to the place of incident, and described in some detail what the days were like, which meant that you and I, as members of the privileged audience, get to take a walk on the wild side of history as the interviewee walked and talked through the very same Esso Station where incidents happened. I’ve often considered about how history has been shaped by the spaces in which they occur (and vice versa), and these snippets help to shed more light on that matter. That’s the kind of stories from the kind of sources that float my boat. People checking out the car-nage. It is also helpful that on a visual level the film has been very well-researched. There is an extensive use of archival footage that helped to set the scenes very well. 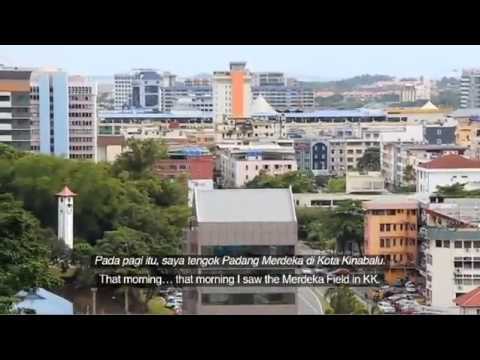 For my part, I found myself laughing at the excellent footage of Tun Mustapha, the former chief minister, exclaiming, “Those who have broken the law…we have no other option. Dead or alive!” He then took a drag of his cigarette, amidst his cheering supporters, before proclaiming: “Everyone to the mosque!” Politics and religion, the godfather and the imam, all rolled into one. The inclusion of pictures also helped to provide a strong visual context to what happened, though some of them were used more than once, which runs counter to my personal taste. My only complaint is that the manipulation of the mise en scene, at times, can be frustrating. To this I refer a little bit to the framing of some of the interview subjects. I wonder whether this was down to Nadira’s setting up of the frame, or the interviewee’s lack of ability to sit still and not move so much (or both). Just in cases, perhaps a supply of Ritalin should be kept within reach next time, but these are things that reflect far more personal tastes than others, so it was not a big deal. Far more distracting, however, were the subtitles. In interviewing some of the subjects, sometimes we are very close to the person being interviewed. Nothing wrong with this, of course, and things go swimmingly well, but then the subtitles pop up and take off nearly half the subject’s face. That was annoying, and I have no qualms in saying that for me, it cut the rhythm of watching this film. Sometimes, the lower third that introduces their names would do the same thing, and it was a lot more distracting than I thought it would be. Perhaps a more creative interpretation of how the diegesis of frame could be played around with should be considered. Having said that, we should bear in mind the fact that at times, there were two languages at play here in the subtitles. As such, the space taken up was double what it usually would have been, and I wonder whether this was something Nadira considered beforehand. I suspect this decision was probably finalised a lot later in post-production, but given that Freedom Film Fest winners are usually distributed on Youtube (and a limited number of DVDs), perhaps due consideration should have been given to these media’s ability to ‘float’ subtitles over the film, rather than having them hardcoded into the image itself. I realise that I just wrote two paragraphs on what was a relatively small issue, but this could be taken as an important consideration for all. Ultimately, though, it should not take away from what is a very important documentary that is worthy of further consideration and analysis, not just because it covers a key aspect of our history, but also because people like me exist. And we need all the history lessons we can get, political or not. Fikri didn’t know there is a band out there called Shannon and The Silent Riot. You can find out more about the documentary here. An interesting third party write up of the film and the context of the incidents can be found here.